Dimensions: (LxWxH): 10.25" x 6.5" x 7.5"
You probably paid special attention to picking your comforter for college and your dorm wall decor, because that's what everyone will see, after all! Well, keep your eyes on the details for all your dorm stuff when you're shopping for college. This College Girl Cosmetic Case - Pink looks great. Its aluminum pink finish with silver aluminum trimming means it'll look better than pretty much any typical college makeup bag out there. 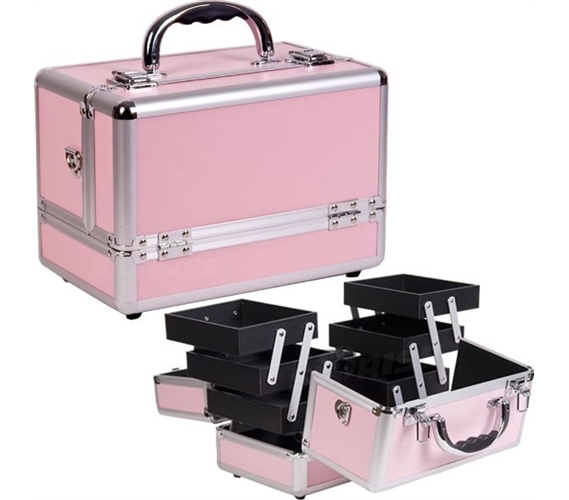 Shouldn't your makeup for college be stored in an organizer for college that looks great too?! They're a valued part of your college supplies, so treat your makeup right. This dorm room organizer case has multiple compartments for storing your makeup, cosmetics, and other beauty supplies and dorm accessories. Its multiple bins will really come in handy when it comes to keeping track of your makeup. You can organize your makeup to have certain compartments for certain cosmetics. It's a simple way of keeping track of one component of your dorm stuff that's very easy to lose and can be expensive to replace. Losing your favorite eyeliner or lip gloss is also an easy way to ruin your day. So don't let that happen; keep everything inside this useful organizer for college girls.